EPA proposes adding new renewable fuel pathways under the RFS. EPA has announced that on May 20, Acting Administrator Bob Perciasepe approved a package of proposed regulatory amendments under the RFS. Key elements of the proposed rules include new approved pathways for renewable diesel, renewable naphtha, and renewable electricity (used in electric vehicles) produced from landfill biogas; renewable compressed natural gas (CNG)/liquefied natural gas (LNG) produced from landfill biogas; and butanol produced in a methods that meet the 50% GHG emission reduction standard. A number of other revisions to the rules are being proposed as well. The proposal will be open to public comment for 30 days, beginning with its formal publication in the Federal Register. EPA releases RIN figures for March and April 2013. In its most recent monthly report, EPA has reported the Renewable Identification Numbers that have been generated under the RFS through April 2013. Most noteworthy was the news that there were 4,901 gallons of cellulosic diesel, corresponding to 8,332 RINs of the D7 category, generated during March, representing the year’s first cellulosic RINs. March also saw over 1 billion D6 renewable fuel RINs (most of which were attributed to cornstarch ethanol) and over 47 million advanced biofuel D5 RINs, most of which were sugarcane ethanol. There were no cellulosic RINs generated in April, but D6 RINs up slightly from March, also at just above 1 billion. The number of D5 RINs generated was down from March to about 28 million in April. More legislation proposed to revise Renewable Fuel Standard. Two new proposed bills to amend the RFS have been introduced to Congress in the weeks since I posted a summary of such bills in my Advanced Biotechnology for Biofuels blog. Representative Pete Olson (R-Texas), with several cosponsors including Jim Costa (D-Calif.), has introduced a bill, the “Domestic Alternative Fuels Act of 2013” (H.R. 1959) that would allow fuels produced from domestic natural gas to qualify as the equivalent of renewable fuels under the RFS. Proponents of the bill cited the alleged impact of corn ethanol on food prices, while opponents criticize the bill because it would defeat one of the intents of the RFS, which was to move the country away from fossil fuel derived energy sources. In a separate action, Senators Bob Corker (R-Tenn.) and Joe Manchin (D-W. Va.) have introduced a bill called the Foreign Fuels Reduction Act, S.977, that is meant to address the current situation under the RFS which favors the importation of Brazilian cane-derived ethanol to meet the mandated levels for “advanced biofuels”. By making simple revisions to one key sentence in the RFS, this bill would require that any reduction made to the cellulosic biofuel mandates also results in a pro rata reduction of the mandates for total renewable fuel and advanced biofuels, which in the words of the sponsors, would “ensure that the RFS is met only by domestically sourced biofuels”. Please see my previous post on my Advanced Biotechnology for Biofuels blog for information on other bills pending in Congress relating to the RFS and other biofuels policies. House committee issues second and third white papers on the RFS. On April 18, the House Energy and Commerce Committee released the second of its series of white papers raising issues relating to the RFS. This paper, available here, discusses “agricultural sector issues” and poses nine questions on food-vs.-fuel topics on which stakeholder comment is requested by April 29. The Committee issued the third white paper on May 9, which examines greenhouse gas emissions and other environmental impacts associated with the RFS and poses a number of questions for discussion. Stakeholder responses were requested by May 24. The Committee now plans a total of five such white papers – the first paper, issued in March, discussed topics relating to E15 and the blend wall. Mixed progress for anti-ethanol bills in the Maine legislature. As previously reported in the blog, there have been four bills on fuel ethanol introduced in the Maine legislature this year. One of these, LD 453, which could potentially ban the sale of gasoline containing more than 10% ethanol, has now been enacted. The bill was approved by the legislature on May 1 and signed by the governor on May 7, but this bill would only take effect if at least two other New England states adopted similar prohibitions. In other action, on May 8, the Maine House of Representatives approved by a 109-32 vote a bill (LD 115) that would ban the sale of corn-based ethanol in gasoline in the state. On May 15, the State Senate rejected LD 115 by a 21-14 vote, apparently killing the bill in this legislative session, although it has recently been reported that the bill has been revived through a “motion to reconsider”, still with uncertain prospects for passage. Even if passed, this bill would also only take effect upon similar action by at least two other New England states. The House also passed LD 105, that would allow sale of gasoline with 5% ethanol, and a nonbinding resolution urging the federal government not to require the sale of E15 gasoline blends, but LD 105 has also been killed in the State Senate, in a vote on May 16. New Hampshire anti-ethanol bill dies in State Senate. The State Senate in New Hampshire has killed a bill, HB362, that would have placed a total ban on the blending of ethanol in gasoline in the state. The Senate’s action to designate the bill “Inexpedient to Legislate” effectively kills the bill for the current legislative session. Bill to repeal Florida’s Renewable Fuel Standard still awaiting governor’s signature. As previously reported, House Bill 4001, a bill that would repeal the requirement that gasoline sold in Florida be blended with ethanol, was approved by the state House of Representatives on April 12, and its companion bill Senate Bill 320 was passed by the Florida Senate on a 33-1 vote on April 24. The bill has gone to the governor, who has until June 4, 2013 to act on the bill. Industry groups are calling on Governor Rick Scott to veto the bill, and a leading Florida biofuels company, Algenol, has said that the enactment of this legislation may cause them to reconsider a major expansion it has planned in the state. California legislator urges Congress to pass RFS Reform Act. A Republican Assembly member in California, Kristin Olsen, has introduced a resolution (AJR 21) that would have the California legislature urge the U.S. Congress to pass H.R. 1462, the “RFS Reform Act of 2013”. As I’ve reported in my Advanced Biotechnology for Biofuels blog, H.R. 1462 would eliminate the mandate for corn-based ethanol in the Renewable Fuel Standard and would also prohibit ethanol blends in gasoline of greater than 10%. The prospects for AJR 21 in the California legislature are unclear, but even if passed, the resolution would have no binding effect on the U.S. Congress. Minnesota legislation. As reported in an earlier blog post, legislation (H.F. 976) is moving through the Minnesota legislature that would alter the state’s biofuel and ethanol mandates. The most significant changes would broaden certain of the ethanol blending mandates to allow use of other advanced biofuels in such blends. Please see the earlier blog post for more details. The bill is now in conference committee to resolve differences between different versions. Here’s an update on recent news items and other public policy developments in recent weeks relating to the development and commercialization of renewable fuels around the world. European Parliament continues debate on RED revisions and indirect land use change. As debate on the proposed revisions to the Renewable Energy Directive continued in the EU Parliament Environment Committee in May, it is clear that member states are divided on aspects of the proposal, particularly regarding the approach to indirect land use changes (ILUC). While some member states strongly support the inclusion of ILUC in calculating the carbon intensity of fuels under the policy, the representatives of other nations question whether such calculations are exact enough to be used in this way. The Environment Committee is scheduled to vote on the proposal on July 10, with a vote by the full Parliament expected in November. The opposing sides of this debate seem to mirror two competing proposals from EU Parliament Committees for how the proposed October 2012 revision should be amended. The Committee on the Environment, Public Health and Food Safety, in a Draft Report issued April 15, recommended mandatory accounting for ILUC as a means to promote use of biofuels having a more favorable carbon intensity, although it also recommended a “grandfathered” grace period for current producers of biodiesel. The Rapporteur for this Committee is Corinne Lepage, a liberal French MEP who also led the recent Parliamentary debate mentioned above. Several weeks earlier, however, the Parliamentary Committee on Industry, Research and Energy (known by the acronym ITRE) published a Draft Opinion on March 28, which suggested a different approach. This Committee proposed eliminating all references to ILUC in the RED revision, stating that ILUC calculations were based on “imprecise” science. The ITRE Committee also proposed that the use of advanced biofuels be promoted through mandatory targets of 2% usage by 2020 and 4% usage by 2025, in lieu of the double or quadruple counting for such fuels that was proposed in October. The ITRE approach has generally been supported by European industry groups, including the Renewable Energy Association, ePURE, and the recently-formed group Leaders of Sustainable Biofuels. Challenges to EU ethanol anti-dumping duty. The U.S. trade groups Growth Energy and the Renewable Fuels Association filed a complaint with the General Court in Luxembourg challenging the duty on U.S.-produced fuel ethanol that was recently imposed by the European Union. This followed action in late April by a bipartisan group of 14 U.S. senators recommending that the U.S. ask the World Trade Organization to challenge this duty. Alleged circumvention of EU ethanol import duty. The European trade association ePURE has asked the European Commission to investigate a situation where U.S. ethanol is possibly being imported into Finland as a blend of 8% gasoline/92% ethanol, as a means to avoid the anti-dumping duty that the EC has imposed on U.S-produced bioethanol. EU Biodiesel investigations of imports from Argentina and Indonesia. The EU, which has instituted both anti-subsidy and anti-dumping inquiries against biodiesel imports from these countries, and has been registering imports from certain Argentine and Indonesian companies under the anti-dumping inquiry, has now reportedly decided to impose anti-dumping duties on imports from these countries. Reports on May 17 indicated that the European Commission has set provisional tariffs at between 7 and 11 per cent for imports from Argentina and between zero and 10 per cent for those from Indonesia. Following two days of talks with EU officials in late April, the Indonesian government is reportedly considering a complaint to the World Trade Organization if the EU follows through with these tariffs. More recently, Argentina has in fact already filed such a complaint with the WTO, in the latest installment of that country’s running battle with the EU over biodiesel imports into Europe. Argentina had previously launched a complaint against Spain’s biodiesel policies, but dropped the complaint when Spain changed its policies. It has been reported that the leaders of the G8 nations are under increasing pressure to revise biofuel mandates in view of the alleged impacts of biofuel development on global food prices. Calls to revise the mandates come as the UK plans to hold a global meeting on nutrition and food a week prior to the general G8 meeting being held in Northern Ireland in June. It has been reported that 41% of Canada’s ethanol mandate is being met by cornstarch ethanol made in the United States. Canada’s federal E5 mandate, enacted to stimulate domestic ethanol production, requires 2.2 billion liters of ethanol to be blended into gasoline each year, but 2012 imports of U.S. ethanol reportedly totaled 893 million liters. Biofuels Digest reports that the South African government is finally moving forward on the implementation of legislation for E2 and B5 blends for ethanol and biodiesel, respectively, for implementation later this year along with a proposed incentive scheme said to be unveiled by the end of June. In Zimbabwe, the government has decided to take control over the Green Fuel ethanol facility, a controversial project that earlier this year was restarted after a long shutdown, following the government’s decision to adopt a policy of mandatory blending of ethanol into gasoline. Although Nepal instituted a 10% ethanol blending mandate in 2004, this policy is reportedly unimplemented because the country’s sole ethanol plant has never commenced commercial operations. Shell has begun sales of E20 ethanol/gasoline blends in Thailand. Here’s an update on news items and other recent developments relating to the “Low Carbon Fuel Standard” (LCFS) programs enacted by California and Oregon and adopted or under consideration in other states, Canadian provinces and regions, to promote the increased use of low-carbon transportation fuels (i.e., fuels with more favorable greenhouse gas emissions than traditional gasoline or diesel). California state court challenge to LCFS regulations. While the challenge to the California LCFS in federal court remains pending, the state’s Air Resources Board (ARB) is also defending the regulations in state court. The California Court of Appeal for the Fifth Appellate District, which has been hearing an appeal in the case of POET LLC et al. vs. California Air Resources Board, issued a letter on February 26 to all parties in the case asking for supplemental information on several issues. This action has been interpreted as an indication that the appeals court will find that ARB violated the California Environmental Quality Act by adopting the LCFS before completing an environmental assessment, among other reasons. The State filed its brief in response to this request on April 2, as have the other parties to the suit. There have also been a number of Amicus briefs filed by other parties on both sides of the issue. New pathways under California LCFS. The California Air Resources Board (ARB) staff has posted four new LCFS pathways on its web site. Three of the newly posted pathways are Method 2 applications proposed by private parties and one is a staff-developed Method 1 pathway. The three Method 2 pathways are for Australian-tallow to renewable diesel, sugarcane molasses to ethanol, and mixed-feedstock to biodiesel; the staff-derived pathway is for compressed natural gas. According to the LCFS regulations, upon posting to the LCFS website, these pathways and their associated carbon intensity values may be used for reporting and credit generation purposes even before they are formally adopted and incorporated into the LCFS regulation. All are available on at the ARB website. Status update of California LCFS published. The Institute of Transportation Studies at the University of California-Davis has published its second status report on the California LCFS. Among the report’s findings were that ethanol represented 78% of the LCFS credits generated in 2012, with 12% coming from natural gas and biogas, 9% from biodiesel, and 1% from electricity. Low carbon fuels were found to have displaced approximately 6.2% of the gasoline and diesel used for transportation in the state in 2012. The report also found that there were net credits of 1.285 million metric tons of carbon dioxide in the system at the end of 2012, which the report says equals about half of the credits that would be needed to meet 2013 obligations. UC Davis critique of 2012 oil industry-commissioned report on California LCFS. The Policy Institute for Energy, Environment and the Economy at the University of California at Davis has issued a report evaluating and critiquing a report issued by the Boston Consulting Group in June 2012 which had been funded by the Western States Petroleum Association (WSPA). The 2012 report concluded that the LCFS would have significant negative effects on the California economy. The new UC Davis report faulted the 2012 report on several accounts, including a failure to assess impacts beyond the oil refining industry, the assumption that Brazilian cane ethanol would be the only significant source of low-carbon fuel, and the assumption that higher fuel prices would not cause Californians to drive fewer miles. The UC Davis report, which was funded by the WSPA along with the Rockefeller Brothers Fund and the Alliance of Automobile Manufacturers, can be downloaded here. Oregon Senate Committee holds hearings, approves bill to extend LCFS. On March 18 the Oregon Senate Committee on Environmental and Natural Resources held a public hearing on S.B. 488, a bill which would repeal the December 31, 2015 sunset date of Oregon’s low carbon fuel standard program, officially known as the Oregon Clean Fuels Program. Testimony was heard from renewable fuel proponents as well as those who oppose the program and its extension. The hearing was carried over to continue on March 20. Written testimony from the hearings can be downloaded from the Oregon State Legislature website. On April 22, the Committee voted to send the bill to the Rules Committee with a “Do Pass” recommendation. In the first few months of the U.S. 113th Congress there have been a number of bills introduced into the House of Representatives and the Senate that, if enacted, might affect the development of ethanol or other renewable fuels. The ones of most potential concern are those, all introduced by Republicans, that are meant to repeal or curtail existing programs that currently benefit the renewable fuels industry. Although I’ve written about many of these bills in previous posts in this blog, I thought it would be useful to post a more complete summary, which I have done today in my Advanced Biotechnology for Biofuels blog. In that entry, I’ve summarized 12 pending bills, all introduced by Republicans in either the House or the Senate, which would significantly affect or limit federal biofuel policies. Included are bills that would eliminate the Renewable Fuel Standard (RFS), or modify the RFS in several ways, e.g. to eliminate incentives for cornstarch-based ethanol or to change the way EPA calculates the annual volume mandate for cellulosic biofuels. There have also been several bills introduced that would prohibit the Environmental Protection Agency from approving ethanol/gasoline blends containing greater than 15% ethanol while also revoking EPA’s prior decisions to approve E15 fuel for certain motor vehicles. Other bills would eliminate some of the favorable tax treatment now available for biofuels and other sources of renewable energy. That post, which has links to the text and up-to-date status of all these bills, can be accessed here. Please look to future posts on this blog for updates on the status of these bills and other U.S. Congressional or state legislative actions that may affect the renewable fuels industry. European Parliament report on ILUC. The Industry Committee of the European Parliament has issued a report on indirect land use change (ILUC) under the Renewable Energy Directive that is attracting opposition from the biofuels industry. The report concluded that different biofuels have different potential impacts on ILUC, and recommended that the RED take these differences into account in measuring progress towards meeting GHG reduction goals. Industry sources are critical of the methodology the EC uses to measure ILUC. Biofuel industry opposition to EC’s ILUC proposal. In late April, a coalition of biofuel industry associations in Germany, Poland, Portugal, Spain and the UK issued a joint statement critical of the recent European Commission proposals to amend the RED and to take indirect land use change (ILUC) into account. The group’s statement criticizes the Commission’s ILUC stance as “based on very uncertain science” and “triggered by the non-factual food vs. fuel debate”. The paper also took issue with other aspects of the proposed RED revision, stating that the proposed 5% cap on food-derived biofuels is a “setback” from current market share, and criticizing the focus on advanced biofuels, which the paper maintains “demonizes” first generation biofuels. U.S. senators challenge EU anti-dumping duty. On April 29, a bipartisan group of 14 U.S. senators sent a letter to the Acting U.S. Trade Representative and the Acting Secretary of Commerce, recommending that the U.S. ask the World Trade Organization to challenge the duty on U.S.-produced fuel ethanol that was recently imposed by the European Union. Looking at it from another perspective, the EU’s anti-dumping duty on U.S. ethanol is predicted to provide a boost to European ethanol production. In 2011, U.S. imports accounted for 20% of the EU market, but analyst F.O. Licht now projects this market share to decrease to less than 5%. This is said to open opportunities for European ethanol producers. It has been reported that fuel refiners in India are rushing to produce or procure enough ethanol to fulfill the government’s mandate to blend 5% ethanol into the nation’s gasoline supplies. The mandate is due to take effect on June 30, 2013. Also in India, the Ethanol Manufacturers’ Association has decided to again approach the national government to demand a price for ethanol that is high enough to cover manufacturing costs in all regions of the country, including those states with the highest production costs. The government of Thailand has set ambitious goals that call for alternative fuels to make up 44% of fuel consumption by 2021, but a spokesman for the Federation of Thai Industries says that this goal is unlikely to be met. The Federation says that meeting the goals, which would require an 8-fold increase in demand from 5 million liters per day to 40 million, is “too challenging”. Brazil instituted tax breaks and low-cost credit lines to support domestic ethanol production and promote lower prices. Industry sources favored the move but said they fell short of what the industry needed. The government of Zimbabwe has approved the use of E85 ethanol in flex-fuel vehicles. The country’s Energy Regulatory Authority announced the move, which is expected to help reduce prices at the pump, on April 10. Sudan has instituted an E10 blending program, in partnership with private companies Kenana and Nile Petroleum. Senate bill would allow MLPs for renewable fuels. On April 24, a bipartisan group of senators introduced a bill entitled the “Master Limited Partnerships Parity Act”, which would extend the benefits of these partnerships (MLPs) to renewable energy, biobased chemical, and energy efficiency technologies. MLPs, which have long been available for oil, gas and other traditional energy companies, have ownership shares that are traded like typical corporate stock but are taxed as partnerships rather than corporations. This structure is viewed as favorable to private investors but is not available to renewable energy companies. It is still too early to know the prospects for this bill in the current Congress, but it has apparently engendered strong support from across the political spectrum. Bills to repeal Florida’s Renewable Fuel Standard. As previously reported, House Bill 4001, a bill that would repeal the requirement that gasoline sold in Florida be blended with ethanol, was approved by the state House of Representatives on April 12, and the companion bill Senate Bill 320 was approved by the Senate Communications, Energy, and Public Utilities Committee. At an April 9 hearing held by the Senate Environmental Preservation and Conservation Committee, the Senate Bill was substantively amended to differ from the House version. The original version of the bill would have repealed the sections that required ethanol blending, but in the amended version, these sections would not be repealed, but would be amended to “encourage” ethanol blending rather than require it. Although the amended bill cleared the Committee by a 7-0 vote, on April 16 the full Senate adopted an amendment that once again made SB 320 identical to HB 4001, so that it would once again repeal the blending requirement. The Florida Senate passed the bill on a 33-1 vote on April 24. The bill now goes to the governor, with industry groups calling on Governor Rick Scott to veto the bill. A leading Florida biofuels company, Algenol, has said that the enactment of this legislation may cause them to reconsider a major expansion it has planned in the state. Minnesota legislation. As reported in an earlier blog post, legislation is moving through the Minnesota legislature that would alter the state’s biofuel and ethanol mandates. Among the changes reported in the omnibus energy bill H.F. 976, the current requirement for 10% ethanol in all gasoline sold in the state would be revised to read “10% biofuel”; the requirement would be altered to require gasoline either to include the maximum percent of biofuel authorized by the EPA (i.e. E15) or to include 10% of an advanced biofuel; and the tiered goals of current law would be amended to lower the short-term goals but raise the 2025 goal to 30% biofuels. Different versions of the bill have been passed by both houses, so the bill is now in conference committee to resolve these differences. E85 consumption, numbers of flex-fuel vehicles, rose in the U.S. in 2011. According to figures published by the U.S. Energy Information Administration, consumption of E85 in the U.S. increased 52% from 2010 to 2011, with over 500 million gasoline-equivalent gallons used in 2011. The rise in E85 usage came despite flat growth of E10 during the same period. EIA also reported that there were nearly 2.47 million E85-capable vehicles on the road in the U.S. in 2012. The full data set can be accessed on the EIA website. 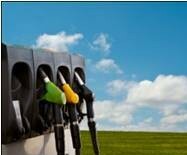 Draft EPA policy may inhibit development of flex-fuel vehicles. EPA has published a Draft Guidance for how flexible fuel vehicles (FFVs) would be treated under its Light-Duty Greenhouse Gas Emissions Program for model years 2016–2019. The Emissions Program sets fleet-average limits on GHG emissions that all automakers must meet, and under current policy for model years 2012-2016, automakers receive a credit for FFVs based on the assumption that each FFV would be fueled with E85 50% of the time. The new draft guidance would reduce this “F factor” to 20% for model years 2016-2019. Many biofuel companies feel this will significantly discourage or deter further development of flex fuel vehicles. The comment period on this draft closed on April 22, but it is not known how quickly EPA will act to adopt a final policy. High RIN prices and E85 sales. The Energy Information Administration, in its April Fuels Outlook issue, predicted that the high prices of ethanol RINs and the expected drawdown of banked RINs would stimulate E85 sales by lowering its price relative to E10, and also create increased incentive for biodiesel blending. Prices for ethanol RINs reached a two-week high on Monday, April 30: 2012 D6 RINs rose to $0.68/gallon and 2013 D6 RINs rose to $0.74/gallon.